FREE 5 YEAR/100K WARRANTY!! SEE OVER 125+ CORVETTES FOR SALE @ BUYAVETTE.NET!! RARE FIND! � 63 RED/RED 340HP !!!!! 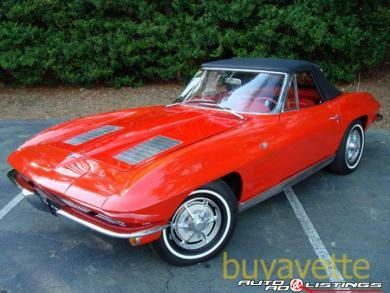 !� Matching numbers 340hp 327ci engine, 4 speed manual transmission. Code correct Riverside Red exterior, code correct Red vinyl interior, Black convertible top. This car has had only 1 owner in the past 34 years! Paint appears to be lacquer and is in good overall condition. Convertible top looks to be brand new, as do the radial tires. Bumpers and chrome are in good original condition. Original AM/FM radio is still in place, as are correct style hoses and clamps. If you are looking for a nice weekend driver, but also want originality to protect your investment, then this original, rare, and very correct midyear may be the car for you! FREE 5 YEAR/100K WARRANTY!! REDUCED!! $39,900. Financing Available.